Posted on April 11, 2019 by Matthew Leib. This entry was posted in Spotlight, Staff Stories and tagged Coaches' Corner, Spotlight. Bookmark the permalink. The No. 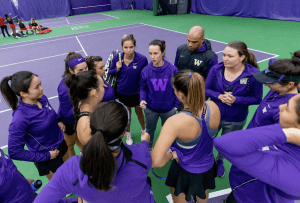 15 Washington women’s tennis team is off to the best start in program history and hosts a pair of key Pac-12 matches this weekend, welcoming No. 13 USC on Friday at 1:30 p.m. and closing out the home portion of its 2019 schedule against No. 10 UCLA on Sunday at noon. Both USC and UCLA are tied with Washington at 6-1 in conference play with the Trojans 16-3 and UCLA 14-5 overall. Admission to all home tennis matches is free. All fans in attendance can receive free pizza after the doubles point! Robin Stephenson grew up looking west. A native of Kitchener, Ontario, Stephenson first traveled to Vancouver to play in tournaments as a high school tennis standout. 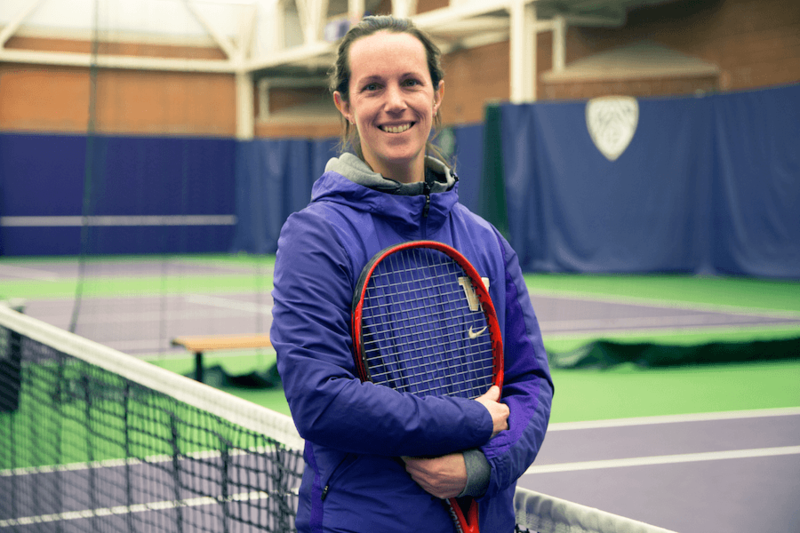 After playing professionally for two years and volunteering as a coach at Georgia Tech, she spotted an open position for an assistant coach at the University of Washington—what she viewed at the time as a “dream job.” So she applied, but ultimately didn’t land the role. Instead, she continued on as a volunteer assistant with Georgia Tech, playing a role in coaching Yellow Jackets women’s tennis to National Indoor Championship seasons in 2007 and ’08 as well as back-to-back ACC titles in those same years. Her next step was to head across town, joining Georgia State as head coach. After leading the Georgia State team to its most successful season in program history in 2013-14, including a first-ever advance in the NCAA tournament, Stephenson again applied to join the University of Washington—this time for the role of head coach. “It was one of those things where I went after it and it fit,” she recalls. 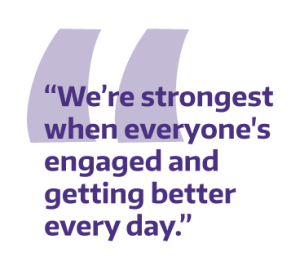 Now in the midst of her fifth season as a Husky, Stephenson is beginning to enjoy the rewards of four years’ hard work in building her own program. Earlier this season, the Husky Women crested into the top ten for the first time since 2004 and currently stand at 16-2 on the season and remain unbeaten in Pac-12 play at 6-1. “We feel really good about where we are—we only have four returning players from last year and six new players and those new players have really just jumped in and helped a ton,” Stephenson says. Even so, it’s been fun to see hard work paying off. The Huskies will be honoring their two seniors, Stacey Fung and Kenadi Hance, during Sunday’s match against UCLA. 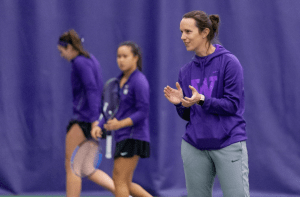 Hance has been a key member of the team during her four seasons at UW, posting a 66-47 overall record in singles matches including a 17-7 mark this season. Fung has been the Huskies No. 1 singles player throughout the season after becoming the team’s first All-American since 2011 last year and is currently ranked No. 98 in singles and No. 26 in doubles. Stephenson points to a “signature” win against a strong Kansas team ranked seventh at the time and sweeps of Utah and Colorado in the team’s first conference matches as tone-setting contests in 2019, adding that a team-first attitude and willingness to put in the hard work has helped separate the Huskies from the pack. Stephenson says that, over her four first seasons with the program, she’s come to a better understanding of the type of player—the type of person—who is going to succeed at the UW. 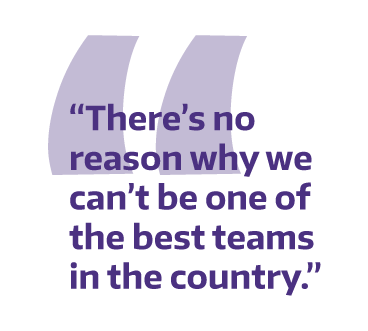 The team rallies behind a cheer of “BETTER—TOGETHER” and spends equal amounts of time focused on the mental and physical elements of the game. It’s a mantra Stephenson adopted early in her tennis-playing career. Determined to be a professional athlete, she settled on tennis at age 11 as her sport of choice, having been introduced to it by her father. She says she loved the feeling of being on court alone with the whole outcome on her shoulders. The sport allowed her to explore a propensity for problem solving that engaged her on a mental and physical level. The idea of coaching first crossed her mind during her sophomore year of college at the University of Alabama. She recalls the passion of her head coach at the time, Jenny Mainz. After playing professionally after college, Stephenson knew she was ready to coach. Coaching, Stephenson says, is the closest one can get to competing again. 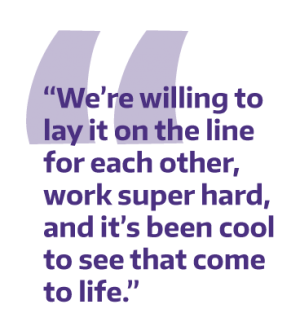 Being on court with her players, working through matches, as well as being a big part of their lives outside of tennis are the elements of the role that most resonate with her. 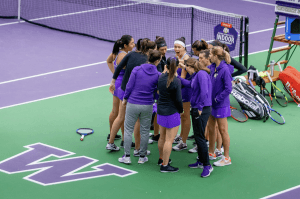 With the team’s final set of home matches happening this weekend, it’s the perfect time for the UW community to get in on the action before Pac-12 Championships and, after that, nationals. Stephenson says she’s eager to see where the season takes them, but isn’t in any hurry to get to the end.